High Wycombe, UK, 3 June 2016 – At PayExpo Europe 2016 (7 – 8 June, ExCel, London), Star Micronics (Stand C21) will be showcasing the largest range of Bluetooth and WiFi POS and mPOS printing solutions approved by the majority of payment partners today. Star will demonstrate its hardware solutions alongside partners including Intelligent Point of Sale Limited and Quetzal who represent just a couple of software houses that have spearheaded Star’s presence in a wide variety of retail and hospitality POS and mPOS applications. In addition, with its partner Smart Volution, Star will be demonstrating a brand of white label POS software that successfully works with accredited card payment solutions. From traditional Bluetooth printers, the unique mPOP™ combined Bluetooth printer and cash drawer solution to an entry-level WiFi printer, Star’s extensive portfolio offers the very latest POS printing technology for a wide variety of applications and environments. Its unique hardware and software solutions with excellent SDKs offer ease of integration, versatility and performance for tomorrow’s retailers and future Star integration partners. For simple yet effective wireless communication the TSP143III WLAN is the latest addition to Star’s renowned TSP100 futurePRNT™ Series that is used by retailers and restaurateurs globally from major department stores and fast food restaurants to pop up stores and cafés. This latest addition to the series offers a range of features including a print speed of 250mm/second, a guillotine auto cutter (MCBF 2 million cuts) as well as thin paper capability providing benefits for the environment and reduced operating costs for the retailer. The cost-effective solution includes the convenience of an internal power supply along with a vertical mount kit in the box. Offering compatibility with all major operating systems including Android, iOS, Linux, Mac OS and Windows as well as easy pairing thanks to a simple WPS connection, this printer offers high functionality and simple wireless setup. Retailers can also take advantage of the futurePRNT software tools available with the entire TSP100 series and, in particular, the setup tool that provides simple web based configuration from any operating system and native setup utilities for iOS and Android. The TSP143III Wireless LAN also features Star’s free digital receipting service AllReceipts™ that offers retailers a fast route to providing the customer with a digital copy of a print receipt. The latest significant feature to be added to this service is Receipt Flip, the first two-sided colour digital receipt option. Enabling retailers to take advantage of the reverse side of digital receipts, as they can on printed receipts, Receipt Flip allows terms and conditions to be displayed as well as store policies, promotions, marketing material, etc. With zero development required, AllReceipts is enabled within the Star printer driver and works independently of a retailer’s POS software. Triggered by a traditional printed receipt, a digital copy of the receipt is sent to the AllReceipts App on the customer’s mobile with no email address or mobile number required. Receipts can only be claimed once and are then deleted, while saved receipts can be viewed by date or by retailer with personal or business tags on the customer’s device. Retailers can also benefit from access to analytics, an in-store customer survey and device management tools. Further enhancing the AllReceipts service, the Engage NOW feature allows the retailer to provide links to promotions, discounts, coupons, etc on the Engage NOW landing page. Customers using the AllReceipts App can simply tap on the retailer’s logo from the list of receipts on their smartphone and be directed to a URL that the retailer specifies. Engage NOW is secure and easily customizable, providing a highly personal customer connection. 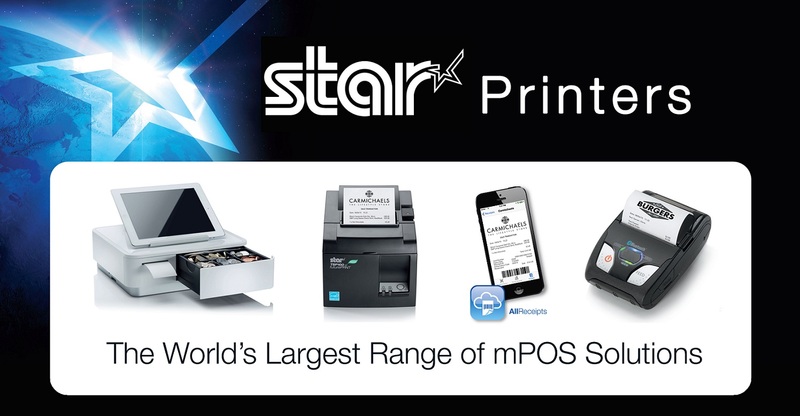 For retailers and hospitality operators of all sizes who want to use the latest mPOS technology, Star provides a unique all-in-one Bluetooth printer and cash drawer mobile point of purchase solution. Outstanding connectivity and compact design alongside intuitive functionality and simple integration define Star’s unique solution – mPOP. Simple and stylish, the lightweight and portable solution is just 10cm high and 30cm wide with a sleek design that will complement any counter top. Alternatively, mPOP with front feed receipting can easily be secured under the counter for enhanced space-saving. With intuitive top loading as well as a partial cut guillotine, the reliable thermal printer automatically cuts the 58mm wide receipt. mPOP can be purchased with a plug and play scanner or this can be added as a later option. For queue busting to mPOS receipting in retail and hospitality, Star offers a range of Bluetooth and WiFi battery operated mobile printers with enhanced functionality now available for Star’s latest Bluetooth mobile printers SM-S230i and SM-L200. Star provides BLE (Bluetooth Low Energy) connectivity for iOS users of the SM-L200, enabling multi-tablet use capability, while both printers are now supported by Star’s WebPRNT™ Browser. This solution offers simple platform agnostic receipt printing direct from web based applications and is available on the App Store and Google Play. WebPRNT is part of Star’s suite of software tools providing feature-rich solutions that work above existing POS software, offer power and paper saving features, effective marketing tools as well as ease of integration.